I got the new Metroid on Tuesday but waited two days to start it. I’d waited a long time for this, and I wanted the moment to be perfect. Metroid is my favorite video game series. Did I fall for these lonely sci-fi action-archeology games when I played the first one, as a 10-year-old boy in 1986? Or as a teenager bound for college when Super Metroid came out? For a good chunk of years after the turn of the century and after I became an adult with disposable income, there were Metroid games all the time: Prime, Fusion, Zero Mission, Echoes, Corruption, Other M. All released in a nine year period. And then, nothing until this new 3DS one, Metroid: Samus Returns. I played each game of the Mass Effect trilogy, in 2007, 2010 and then 2012 with a custom blonde lead character I named Samus. Didn’t cut it. In 2012, I hoped I’d get minor satisfaction from the the Metroid-themed multiplayer shootout in the Wii U launch game Nintendo Land. I didn’t. In 2013 I looked to the side-scrolling Arkham Origins: Blackgate, designed by some of the architects of the Metroid Primes. Almost, but not quite. In 2014, at the tail end of a two-week vacation in Australia, I finally played the one Metroid game I’d missed. I started 1991's Metroid II: Return of Samus, which I had downloaded to my 3DS. It was too strange, too different, too basic, and I was on an island resort and perhaps needed to go outside. It wasn’t the right time or the right game. They said 2015’s Ori and the Blind Forest would feel like a great, new Metroid game. I tried it. It was close. In 2015, I went back to 2002’s Metroid Prime for the first time in a decade, then reviewed it in 2016. It was great to be back, but it wasn’t new. In the summer of 2016, in Metroid Prime Federation Force, I finally encountered Samus Aran in a video game again. Too bad Federation Force is all about co-op multiplayer and mech suits. It’s about as Metroid as a bowl of spaghetti is a pizza. Metroid: Samus Returns for the 3DS arrived in the mail from Nintendo on Tuesday this week. It’s out on the 15th, but as a member of the press, I got a copy early. Nintendo said I could play it immediately and write about it on Saturday. I could review it closer to release. I didn’t play it immediately. I was busy at work, and the subway I ride home each day is noisy, so I didn’t play it there, either. I didn’t want my first time playing a new Metroid game to be somewhere cacophonous and crowded. At home, I had games to play for more pressing deadlines. I didn’t want to cram Metroid into the drowsy moments after I’d finished with something else. It’s strange to play each minute of this new Metroid while thinking: I hope this is going to be good enough that people buy it enough that Nintendo will make more. I waited to play until Thursday night, when I was alert and alone and had access to headphones and a couch along which I could stretch my legs. Finally I booted it up. I saw the logo, heard the music. I waited some, the way I sometimes do after dinner to savor the moment when dessert is on the table and no longer hypothetical. I pressed forward and the game asked me to select my save file. I paused again, then clicked through. 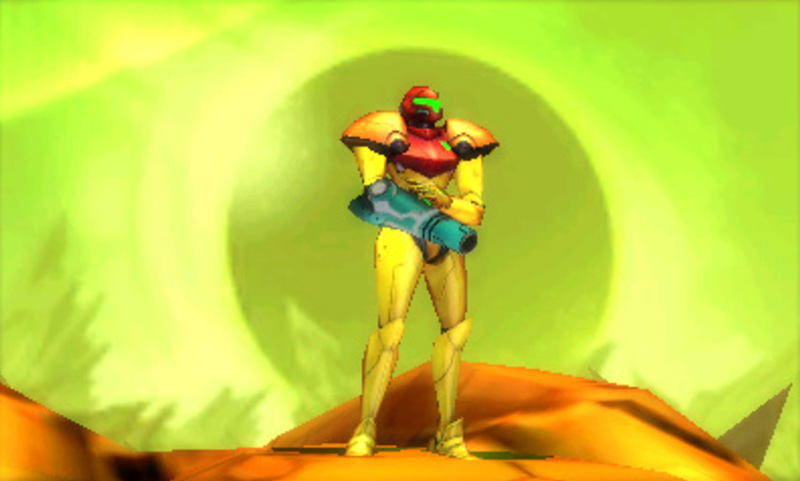 For the first time in too long, I took control and moved Samus Aran across the screen in a new adventure. It’s weird to play a game and not be able to blot out the context around it. It’s strange to play each minute of this new Metroid while thinking: I hope this is going to be good enough that people buy it enough that Nintendo will make more. We know they’re going to make another Metroid game. Nintendo has already promised a Metroid Prime 4 for Nintendo Switch, but we’ve gotten Metroid side-scrollers like Samus Returns so rarely. The last new portable one came out in 2002. That was before Mario Party 5 through 10, before the last nine Zelda games, before Pokémons Diamond and Pearl, Black and White, X and Y and Sun and Moon. I was 26 when I played Metroid Fusion on my Game Boy Advance. I turn 41 this month. Image via Nintendo’s official site. I don’t have gear like this in the first hour. In other forms of entertainment, it’s easier to avoid this situation. It’s easier to be satisfied with the past without craving for a sequel. The classics can be enough. We don’t spend a decade pining for the new version of a great novel or symphony or song. The best hold up and are easy to re-approach. This isn’t always true for video games. Many older games diminish somewhat as technology advances. They’re harder to access. They don’t run as well. Even the best ones bear some of the bad ideas of creators still figuring things out as they craft work in the youngest mass entertainment medium. I can go back to old Metroids and enjoy them, but I’ve assumed that future ones can be even better. It’s a reasonable assumption, given the medium. Games have long benefited from iteration in a way that, say, movies have not. It even happened with Metroid, a great game brilliantly trumped by Super Metroid and happened again when a switch to the first person-shooter format, of all things, led to an unexpectedly brilliant trilogy. That first Metroid even got a remake, Zero Mission, that bettered it and added some twists. Game series can and do often improve, but some game series don’t get the chance to keep at it. Few cease due to the attainment of creative apotheosis but to the fear that the next one wouldn’t sell well. Not enough people were into it anymore, but it doesn’t mean better versions and sequels couldn’t have been made. No complaints so far, but also too early to say if its world interlocks with the cleverness that made backtracking in the best Metroid games fun rather than tedious. That’s always been part of the subconscious hope I’d had about Metroid, as I have with any gaming series: the realistic anticipation that because these are video games, the great thing I loved could still get a better sequel or remake. Years without a new entry seem like squandered time, unless, maybe, this time, the greats couldn’t be topped. So I’m also playing with trepidation that this new one won’t be as good. Could Metroid have peaked long ago? Do I want to discover that now? Nintendo has apparently crunched the numbers and determined it might be lucrative to bring Metroid back. Soon, we can all play new ones. I’m playing with the hope that the engine of iteration will rev back up, that better Metroid games, perhaps even the one I’ve now started, are upon us. I’ll keep taking my time and stretching this one out, but I’ll have my answer soon enough. Nope. Haven’t reached this part either. This, however, is a mere preview, as they call it. I’m only an hour in. I’ve assigned the review for this game to a colleague who I know who will handle it well. I’ve got other games to cover, but I also get to savor this one. In the early going, I’ve gotten the morph ball and the ice beam and found some missile tanks. It’s mostly been fan service so far. Because it’s a remake of sorts of Metroid II, I can see glimpses of that Game Boy game I played a few years ago in Australia. As with that one, this is a game about Samus Aran hunting down a set number of Metroid-based enemies in the partially-flooded caverns of the planet SR388. You’re given a number to hunt, little mini-boss battles for each as you find them, and then the poisonous liquid that previously blocked some of your exploration lowers, letting you descend deeper for the next hunt. There’s a clever new melee counter system that turns combat into a rhythmic two-step of batting a charging enemy and then zapping them. It’s good. No complaints so far, but also too early to say if its world interlocks with the cleverness that made backtracking in the best Metroid games fun rather than tedious. It’s too early to say if this has the ingenuity of Zero Mission’s expansion on the Metroid game that it remade. For now, I’m just happy to be playing one of these again. I’m delighted to see that the map completions percentages go to the tenth decimal place and that there’s a lot of hidden stuff to unlock. The depth of the stereoscopic 3D is stunning and the only sensible way to play. The music is terrific. Looming above any of my particular impressions, a pair of emotions: hope that the next few hours reveal something more special than a simple remake, and wonder that I’m playing a new Metroid game at all.